Local chef and farm-to-table proponent Budd Cohen is one of several nationally recognized food professionals who will present at HOMEGROWN Village, Farm Aid 2018, on Saturday, Sept. 22, at the XFINITY Theatre in Hartford, Ct. The annual festival, a day-long celebration of food, farmers, and the farm-to-table movement, features an array of artists and outstanding musical performers, such as Dave Matthews, John Mellencamp, Willie Nelson, and Neil Young. Cohen, a pioneer in the farm-to-school movement in the Philadelphia region and currently the Director of Food Services at Springside Chestnut Hill Academy, will demonstrate how to make delicious recipes using farm-direct products. He will also provide education on how to start up a farm-to-school program. 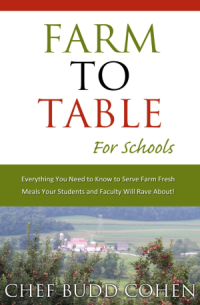 Author of “Farm to Table for Schools,” Cohen instituted farm-to-school programs at four local schools with the encouragement of his employer CulinArt inc. He is sought by many schools, businesses and organizations interested in learning about incorporating healthy eating and food choices into their menu offerings. He has appeared on local television and radio demonstrating his whole foods philosophy and cooking techniques. Farm Aid was started in 1985 by musical artists Willie Nelson, Neil Young, and John Mellencamp to raise awareness about the loss of family farms and to raise funds to support farmers. Farm Aid has raised more than $53 million dollars since then and is a nonprofit organization whose mission is to keep family farmers on the land.